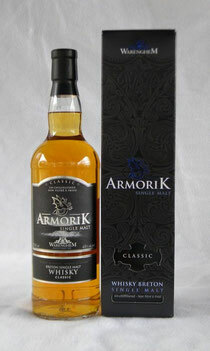 Armorik Classic Single Malt French Whisky has the distinction of being not only the oldest Whiskey made in France, (25 years) but the only French single malt whisky sold in the US. In addition to all the attention Armorik is earning from its exceptional quality, the Warenghem Distillery, producers of Armorik have created an exciting new package design reflecting the long history of the distillery itself. The new design is pictured here and is now available in the US. If that is not enough, Warenghem plans on releasing two other whiskies early in 2012; first a double barrel Breton single malt (Armorik Forest Oak / Sherry Cask) and then a limited release, vintage 10 year old, Breton single malt. We will keep you posted.